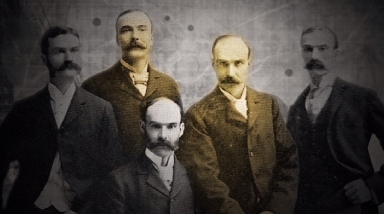 A student-produced documentary will explore the impact the five Ball brothers have had on east central Indiana since the 1880s, when they moved their glass manufacturing business from Buffalo to Muncie — transforming the community into an industrial force in the Midwest. “A Legacy Etched in Glass: The Ball Brothers in Muncie” is an immersive learning project by Ball State University under the direction of Chris Flook, a telecommunications instructor. The film explores the lives of the five brothers, the family legacy in Muncie and the core values that propelled them to success: hard work, philanthropy, entrepreneurship and beneficence. The story weaves cinematography, motion graphic animation and archived material with interviews from historians. Building their factories on the south of side of Muncie, the Ball brothers expanded their operations enormously over several decades in the early 20th century. Even after the natural gas ran out, Ball Corp. continued to produce glass in Muncie well into the 20th century. Ball Corp. spun off two enterprises — today known as Jarden and the Ardagh Group — before moving fully to Colorado in the late 1990s. Ball Corp. currently focuses on avionics and beverage container manufacturing. “Legacy” not only explores the lives of all five brothers, their wives and other family members, but it also explores the wide-ranging philanthropic efforts of the family in Muncie over the past 120 years. The documentary will have its public premiere at 6 p.m. Sept. 25 at Minnetrista. Watch a preview of the documentary, and learn more about the project online. Chris Flook, who also serves as executive producer, may be reached at caflook@bsu.edu or 765-730-0841. Sure, I could insert some clever references here to kryptonite or various villians faced by one of America’s favorite comic book, TV and movie characters. But Waiting for Superman is too serious and too important to become a laugh line. The David Guggenheim film has the education community (and hopefully soon many others) abuzz. It is, in the words of a National Review Online column, a "stabbing review of teachers’ unions and a plea for more charter schools." Yon can check out the movie trailer and learn more. But below is a condensed review that does a good job of letting you know why you should be paying attention. Bianca, Daisy, Emily, Anthony, and Francisco come from diverse locales — Harlem, L.A., Silicon Valley, D.C., and the Bronx — and are black, Hispanic, and white, but they share the same basic problem: Each is consigned by geography to an inadequate public school. Each wants a choice. The stories are heartbreaking. But the real message of the movie is revealed in the scenes of the adults who produce this heartbreak. Superman’s most memorable episode is the cartoon illustration of the “lemon dance,” in which school principals waltz their “lemons” (teachers who just can’t teach but can’t be fired) from school to school. The musical number would be hilarious if it weren’t so devastating. So, too, for the shots of the infamous “rubber rooms,” where middle-aged teachers sit in school kids’ chairs, playing cards or laying their heads on their desks to sleep, collecting full pay and pensions. Weingarten, obviously, can take the criticism, but she hasn’t rebutted it. Perhaps it augurs victory that the only thing she can find to fault is her opponents’ tone of voice. For now, though, Weingarten still has the power and the money. Weingarten’s AFT funneled over $1 million to defeat D.C. mayor Adrian Fenty (who appointed and supported Rhee) in the recent Democratic primary. The winner, Vincent Gray, used his victory speech to announce his desire for “a strong, empowered chancellor who works with parents and teachers.”Translation: Rhee is out. This is part of a pattern. Guggenheim, whose political sympathies are normally liberal, admits that the Democratic party is, on education policy, a “wholly owned subsidiary of the teachers unions.” The AFT and NEA — combined, the biggest campaign contributors in the U.S. — send more than 90 percent of their donations to Democrats. Waiting for Superman, with all the noise and buzz it’s generating, with the acclaim it’s received from diverse political circles, might be just the thing to start the boat rocking.